Great plant-eating dinosaurs roaming the earth, feeding on lush ferns and palm-like cycads and bennettitaleans … smaller but vicious carnivores stalking the great herbivores … oceans full of fish, squid, and coiled ammonites, plus great ichthyosaurs and long-necked plesiosaurs … vertebrates taking to the air, like the pterosaurs and the first birds. This was the Jurassic Period, 199.6 to 145.5 million years ago*  a 54-million-year chunk of the Mesozoic Era. Named for the Jura Mountains on the border between France and Switzerland, where rocks of this age were first studied, the Jurassic has become a household word with the success of the movie Jurassic Park. Outside of Hollywood, the Jurassic is still important to us today, both because of its wealth of fossils and because of its economic importance  the oilfields of the North Sea, for instance, are Jurassic in age. 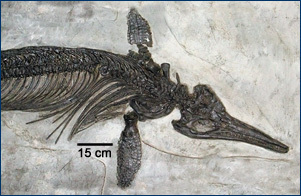 Clockwise from top left, Ichthyosaurus intermedius, a Lower Jurassic ichthyosaur from Glastonbury, England. 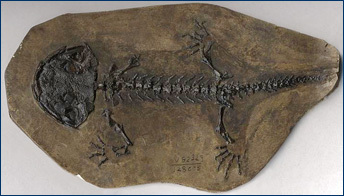 Karaurus sharovi, one of the earliest known salamanders, from Kazakhstan. 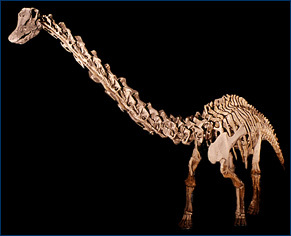 Diplodocus, a large, long-necked sauropod. Modern cycads. Today, the name "Jurassic" conjures up images of the phenomenally successful book and movie, Jurassic Park. It is quite true that the dinosaurs dominated the land fauna  although many of the dinosaurs featured in Jurassic Park, such as Triceratops and Tyrannosaurus rex, did not evolve until after the Jurassic was over. The largest dinosaurs of the time  in fact, the largest land animals of all time  were the gigantic sauropods, such as the famous Diplodocus (top right, above), Brachiosaurus and Apatosaurus. Other herbivorous dinosaurs of the Jurassic included the plated stegosaurs. Predatory dinosaurs of the Jurassic included fearsome carnosaurs such as Allosaurus, small, fast coelurosaurs, and ceratosaurs such as Dilophosaurus. The Jurassic also saw the origination of the first birds, including the well-known Archaeopteryx, probably from coelurosaurian ancestors. But there was more to life than dinosaurs! In the seas, the fishlike ichthyosaurs (top left, above) were at their height, sharing the oceans with the plesiosaurs, giant marine crocodiles, and modern-looking sharks and rays. Also prominent in the seas were cephalopods  relatives of the squids, nautilus, and octopi of today. Jurassic cephalopods included the ammonites, with their coiled external shells (upper left), and the belemnites, close relatives of modern squid but with heavy, calcified, bullet-shaped, partially internal shells. Among the plankton in the oceans, the dinoflagellates became numerous and diverse, as did the coccolithophorids (microscopic single-celled algae with an outer covering of calcareous plates). Land plants abounded in the Jurassic, but floras were different from what we see today. Although Jurassic dinosaurs are sometimes drawn with palm trees, there were no palms or any other flowering plants  at least as we know them today  in the Jurassic. 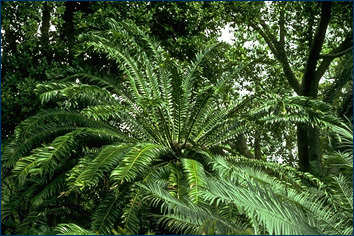 Instead, ferns, ginkgoes, bennettitaleans or "cycadeoids," and true cycads  like the living cycad pictured above, lower left  flourished in the Jurassic. Conifers were also present, including close relatives of living redwoods, cypresses, pines, and yews. Creeping about in this foliage, no bigger than rats, were a number of early mammals. Blue Nile Gorge, Ethiopia: Come along on a fossil-hunting trip to Ethiopia with UCMP researchers and see the first dinosaur fossils found there. Solnhofen Limestone, Germany: Exquisitely detailed fossils have come from these Jurassic deposits in southern Germany. Find out more about the Jurassic paleontology and geology of North America at the Paleontology Portal. See the Wikipedia page on the Jurassic.